Moving week. It is a week that has become a regular tradition in my own life. I have moved so many times in my life that I stopped counting long ago. Despite having lots of practice it never seems to get any easier. I continue to pare down my possessions each time and I find moving to be incredibly therapeutic and stressful at the same time. And despite not tracking my moves, I do track the number of times I have driven more than 1,000 miles in a single day and I have now done that 22 times. All of those rides were solo, most were with a complete car full of stuff and bikes hanging off the back. It may not mean much to some but it means a lot to me. To me it defines my character. Swimming, biking, running and completing an Ironman is tough, but I know many people that have done it. I really don't know anyone that travels 1,000+ miles in a car by themselves - not even the professionals. I'm sure there are people out there, but for me it is a way to set a personal benchmark of what is achievable and to compete with myself. I'm sure a time will come when I won't be able to do such epic travel days but it serves as a slice of mental training as it stands. Speaking of mental training. So often I hear athletes talking about reading books about mental toughness or mental training. They work with coaches, they practice what they can. I rarely pipe in an add my two cents on this topic, but my own two cents is that you simply can't learn about mental toughness in a book. Mental toughness comes from experiences where you are on the edge of complete shutdown/failure/breakdown and you push thru the mental barrier that exists. So often people think the barriers are physical but sometimes you have to free your mind and see that the barrier is really not physical and it is purely a man-made mental barrier. And although epic travel days serves as a sort of mental training for me, every trip seems to have its own sort of adversity that pops up out of nowhere. This trip this past week was no exception when I ran into a gas station on empty. I'll share a longer version of the story but the short-end is that whoever built the Kansas Turnpike should be fired and have their pension revoked. And now for some color. The Kansas Turnpike is one of those closed-road toll-roads giving you no opportunity to get off except at very few designated places. Services are placed incredibly sparsely, in this case 56 miles between service stations. 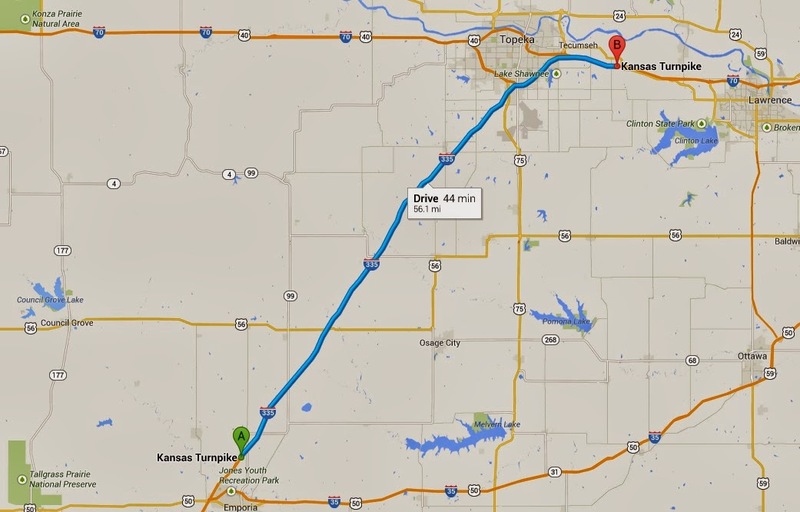 To be fair, I guess I could have got off the toll-road, drove in to Topeka to get gas, and then got back on it. But that seemed like a pretty good detour to do so and the toll-road itself was already pricey, and I really didn't want to incur any additional fees or lose any additional time. 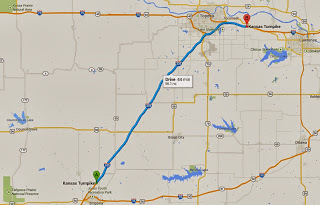 I also assumed there would be a service station slightly after Topeka, but we all know what happens when you assume. Well, that service station never appeared and I kept going with the dash light for gas popping on and off, on and off, and on and off. I was now heading southeast and the wind was roaring from none other than the southeast. 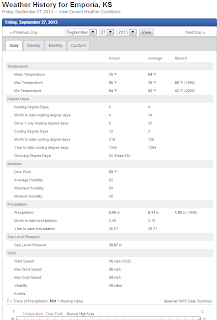 Let the record stand that the average wind speed was 15mph SSE on the day, however looking at hourly data shows an average speed of more like 21mph SSE when I was going thru. 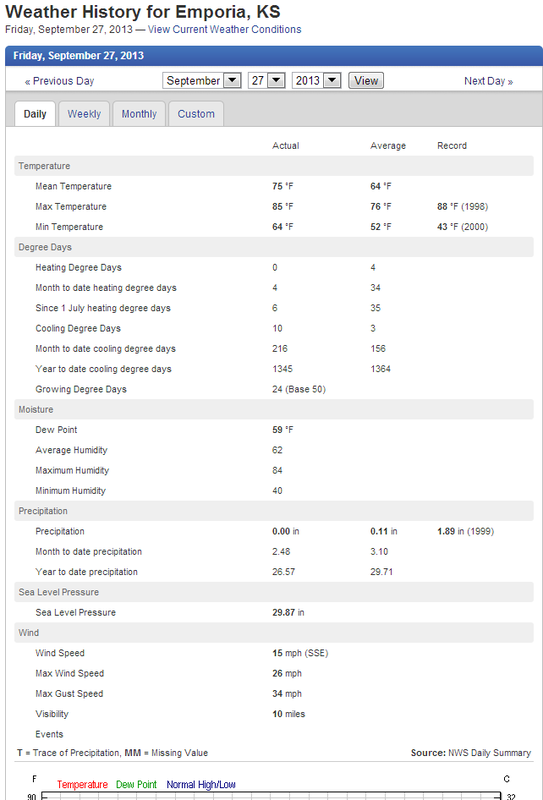 For those not familiar with wind speed that is a pretty good clip. And this is only compounded by the fact I was out in the middle of nowhere and not in a sheltered city. I was also towing two bikes on the bike and a loaded car. Instead of the 30-35 mpg I can get, I was getting somewhere around 15 miles. Along the route, I was going back to all the close calls I had with gas. One of the closest ones I ever had was with my Cousin Bob driving across Alligator Ally in Florida for a New Year's Eve party. But at least they warn you in Alligator Ally with signs *Hey no gas for 50 miles, fill up now*. I was shocked I was never warned. Had I been warned I would have surely stopped. For those Seinfeld fans out there, the red gas line was so far below the E that I thought it was going to break off. For those who are not Seinfeld-aware I have posted the clip below. Anyway, it finally came to a point where the was a chance to get off the highway. There was also a tiny sign that said next services 17 miles. The only problem was my on-board computer said I only had 11 miles left. I immediately pulled over and shut down the engine. I could get off and travel down some remote road, but services that way were not really any shorter. I could get off and drive very slowly to increase MPG but who knows what the route would be like, how many turns, stop-signs traffic, etc. Plus the time to go back and forth. In the end I just decided to roll the dice. Worst case scenario I run out of gas and I end up getting in a ride. However, I really wanted to make it for time sake and that is where the knowledge of being a triathlete came in handy with regards to aerodynamics. It is easy for car drivers just to push the pedal but as athletes the cost is directly felt by the required increased effort and thus we have a finer appreciation for efficient driving or at least we should. 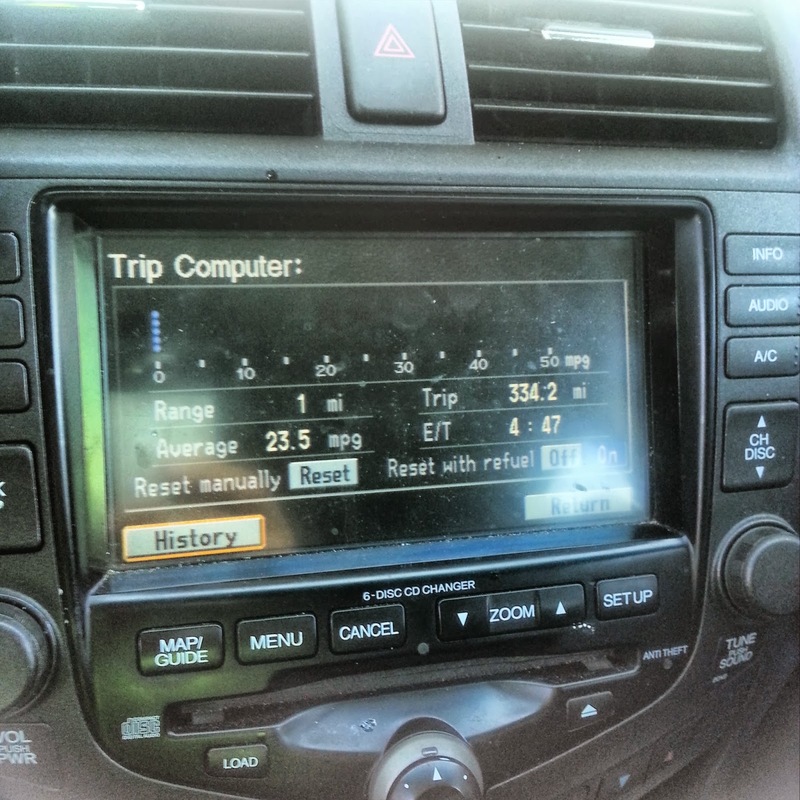 And although I don't drive with the AC and I had already shut off the audio system many miles back, I went one-step further and turned off the dashboard lights and kept the Nav system off. I further waited for a 18-wheeler in the distance and came up to speed slowly. It was a good timed effort and I grabbed the best draft I could without any punches to the accelerator. I gritted my teeth for the next 17 miles. I rolled into the gas station and naturally all the pumps were occupied, but I was able to secure a pump and turn back on the car computer systems and it said I had 1 mile left. Besides that one snafu, everything else went ok. 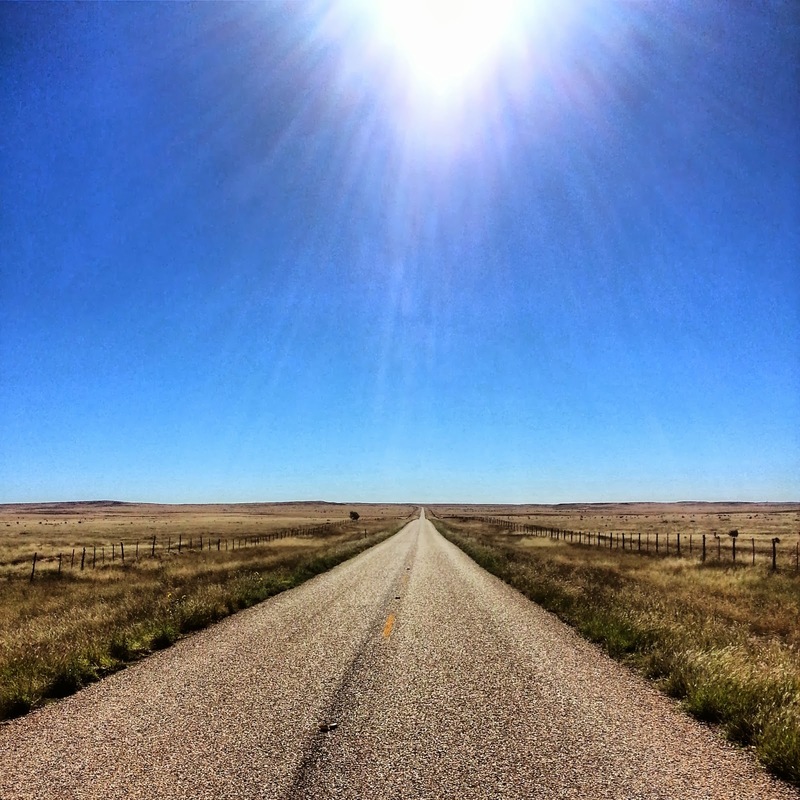 I even had the opportunity to enjoy a completely barren and obscure road in Texas. Over the course of 100 miles I saw two vehicles on that road - I saw more than two snakes on that road. It wasn't a route that my own Nav recommend nor Bing Maps, Google Maps, or Mapquest. But the road was a surreal experience for me. It was a reminder that there are so many ways to get from Madison to Tucson. I could have taken that highway road that so many take. The safe road, the plan... but that is the beauty in life and the beauty in freedom. There are many ways to the top of the mountain and I often choose the road less traveled. Yes, it is true that if you have problems on the road less traveled that you are often SOL. However in this case I was rewarded with a much faster route, shorter route and the blissfulness that is provided to me by a quiet open road. As for training. I debated whether the move was appropriate timing with Kona on the Horizon. I'm not so worried about a little rest, but long-haul travel with 1000+ mile day and 800 mile day isn't easy and take something out of you in a different way. Coming to Tucson allows a little better heat acclimation prior to Kona and I still got in some decent training, but overall it was a very busy week with the move and that resulted in low volume and intensity.